BrainCast looks like an interesting service. Users can record personal notes for later retrival. Essentially, it's a free voicemail service. All you need to do is dial a toll-free number and record your message. You can retrieve the message by checking your email later. 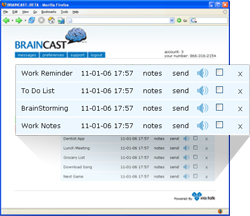 BrainCast is intended to be used as a service to help store and organize audio notes from anywhere. Anytime you think of something where you don’t have a simple method of writing something down or making a note of it, like at the store, or in the car, or out at night, is an optimal time to use the service. Just call, wait for the beep, record, and it will be home and on your computer when you get there.